The rendezvous point is usually in the area of Harrismith or Van Reenen. This is where the climbing areas are. Climb either at Swinburne or Eagle Mountain, or both. Camp or stay over in chalets with very well maintained facilities. Climbing is mostly sport climbing and grading/difficulty range from complete novice to expert. All equipment and guiding are included. You can either spend more than one day here, or a day at each crag. Up to you! From Harrismith, take the N3 Highway and make your way down Van Reenen’s Pass. 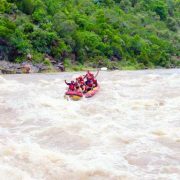 Proceed to Tugela Rapids Lodge next to the Tugela River, your rustic but comfortable base for the rafting session. This is true farm style! Run rapids ranging up the Class 3+. No experience needed. Fun, continuous and challenging. 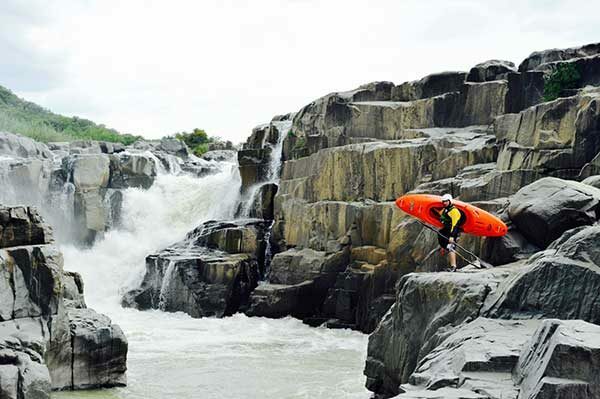 Your accommodation at Tugela Rapids Lodge, equipment, guiding, a light lunch and transport are included. Make your way to Cathedral Peak in the beautiful Central Drakensberg. This abseil has ‘stunning’ written all over it. It is a fantastic way to see this part of the ‘Berg. It is quick to set up, safe, high enough (45 metres) and really exposed. It is about a half-day outing. No experience is required! This is a very well known and well walked route in the Cathedral Peak area of the Drakensberg. It is about a three to four-hour round trip through a beautiful indigenous forest. Almost half the time is spent river crossing and boulder hopping. 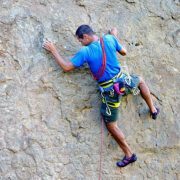 The highlight is walking underneath a huge boulder trapped between cliffs on opposing sides; as well as climbing a chain ladder up a waterfall. Take note, this one-day hike can be replaced with any other one-day hike. Also up to you! When to go: Best during high summer (October-March). Winter months (April-September) are also suitable, but river activities will then not be included (off season). Other information: No experience required and all you really need is to bring active wear. Since it is mountainous environment, always bring cold weather gear. Depending on the length of your outing, catering arrangements will be made. No off-road vehicles are needed. Depending on your choice of accommodation, we will recommend and coordinate travel and accommodation arrangements.